Going into this holiday weekend, I’ve been thinking a lot about hospitality. Now that we are moving, time with precious friends becomes more important. We want to enjoy time visiting, talking and letting the kids play together; before we no longer live nearby. Often, we get wrapped up in having everything “ready” in order to entertain. Yet, that’s not really what hospitality is all about. 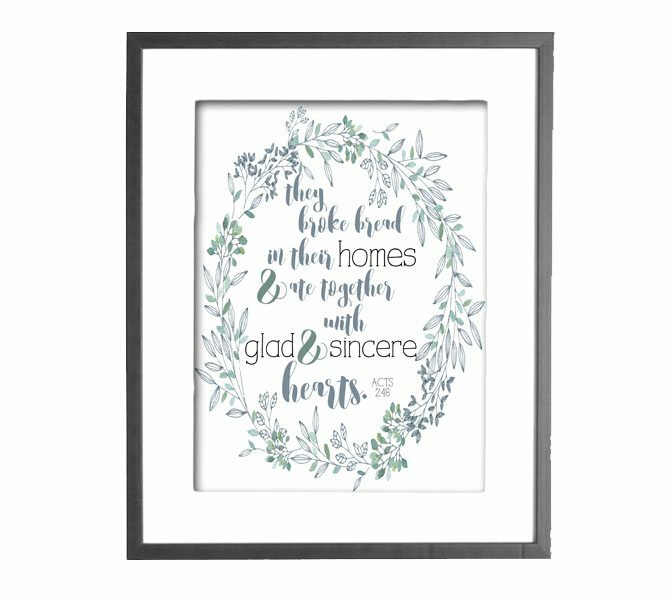 I think of this scripture in Acts, which reads “They broke bread together in their homes and ate together with glad and sincere hearts.” God has impressed on me that our heart, not our homes, is what defines true hospitality. As much as I love to decorate — and create — a beautiful home, I know that hospitality means being comfortable letting others into our home when it’s not perfect. I’m not perfect, my family isn’t perfect and our home isn’t either. My friends and family know that. Welcoming them into our home, even when it’s not perfect, requires a sincere heart that is honest about our imperfections. Running around crazy, snapping at my kids to clean things up, being impatient and anxious… that isn’t hospitality. Even though our guests haven’t even entered the home yet, I’m not preparing for them with a glad heart. Instead, a glad heart asks the kids for help; but in an encouraging and uplifting way. I should ask for their help with an attitude that isn’t focused on perfection but instead, is focused on the anticipation of visitors. 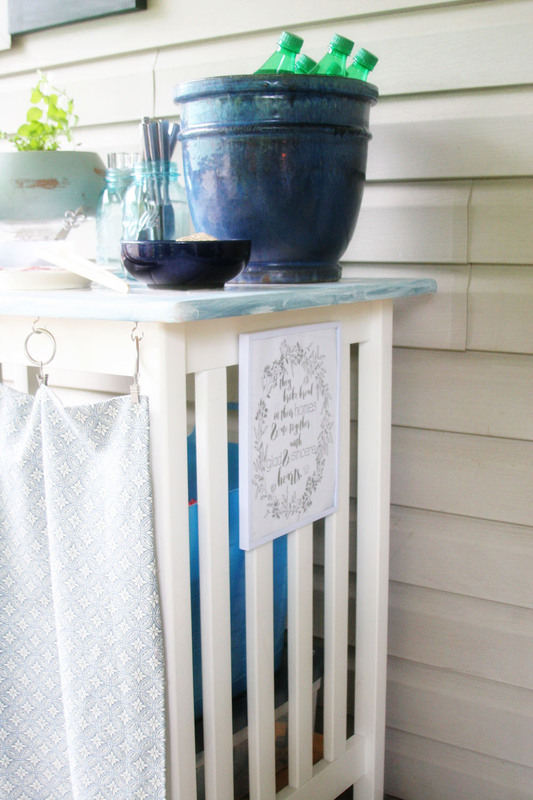 As a reminder of what true hospitality is actually about, I’ve hung this Bible Verse Art on our deck, where we often entertain. I’ve created an 8×10 version for you to download, too. You’re getting a peek of a recent project completed for our deck. I’ll be sharing it next month, but I completed it with hospitality in mind, too. So much of hospitality is in the preparation, both of our hearts and our homes. When it’s simple to entertain, we are more likely to invite others into our home. It’s not as difficult to offer a glad heart when we’ve been intentional about creating a home that welcomes guests. 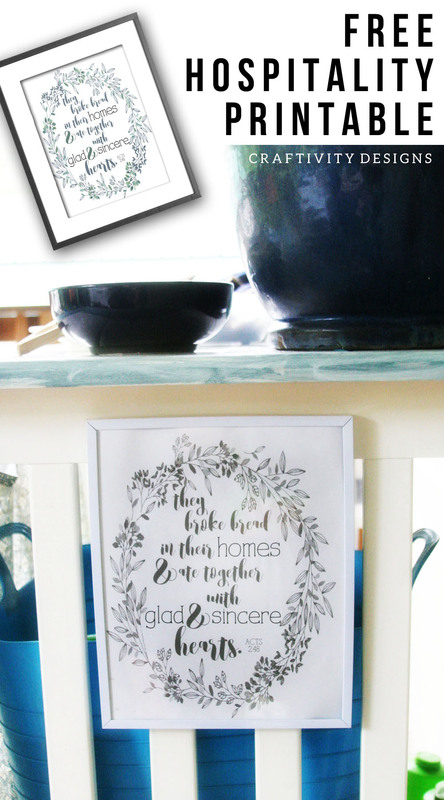 There are simple ways to be intentional in our homes, to make it guest friendly…. just having a place for someone to sleep, a place to serve food and a place to relax and a place to play. They won’t necessarily be perfect spaces, but they can be prepared in a way that doesn’t require rearranging our entire home to welcome a guest. I don’t want to let last minute visits invoke anxiety so that I can focus on the anticipation of visiting with friends. 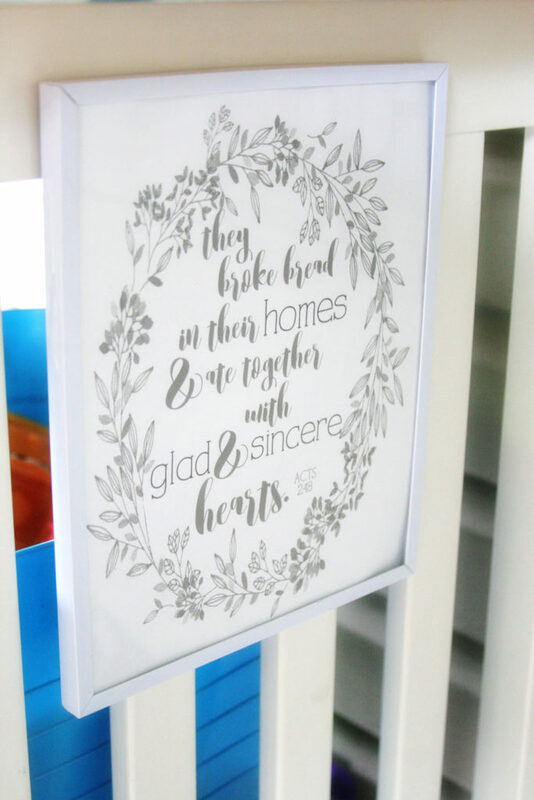 How can you better prepare your home to welcome others with glad and sincere hearts? I used to get so worked up when we were having people over and tried to have the house spotless! That’s kind of gone by the wayside. Before we moved, we had some friends over. The home was welcoming but not spoteless. It felt so great and took away that stress. Thank you, Lora!!! I can still be guilty of that, too, but I’m trying to remind myself that isn’t what is important. It can be hard! This is so cute! I love this, my home is never super clean and perfect when anyone comes over. I have a toddler and as soon as I clean, somehow a new mess has arrived! And that’s okay, I don’t need my home to be tidy to be welcoming. It will also help other feel better when I come to their home, they won’t feel the need to scrub the floors! I LOVE this Lora!! No one has the perfect home. But everyone can be genuine and caring and have a “glad heart” <– love that! Thanks, Sarah 🙂 I appreciate your sweet comments! This was very eye opening; I had never thought of hospitality like this, but it is so true! A clean house doesn’t make a welcoming house (unless the people are welcoming too)! Thanks, Jamie! Glad you stopped by! Is the Acts 2:48 available for downloading and printing at home? I don’t see a link to it. I love this scripture! Yes! Enter your email, near the end of the post in where there is an image that says “Would you like access to free printables and templates?” and “Sign Me Up” below the image. Then, the link will appear in that spot. It will say “DOWNLOAD NOW: Hospitality Print” which is where you click. Thanks! Let me know if you run into any problems!